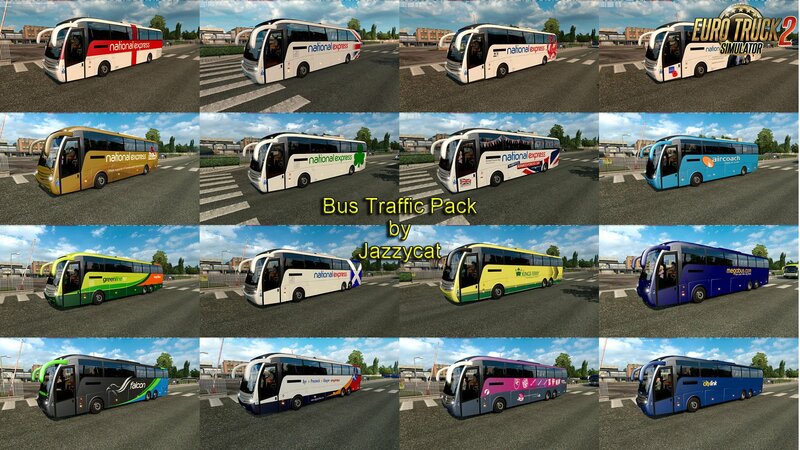 Bus Traffic Pack v2.4 by Jazzycat (1.28.x) for Euro Truck Simulator 2 game. – added new bus Setra S516 HD/2 and new skins. – added new bus Ikarus 255(by Frank007) and new skins. - added new bus Caetano Levante and new skins. Pack adds in traffic 26 new models of buses with 300 skins (Setra, Neoplan, Volvo, Man, Mercedes-Benz, Ikarus, Ayats, Irizar, Temsa, Jelcz, Caetano). For versions 1.27.x and 1.28.x beta.